converts color specifications in expr to refer to the color space represented by colspace. The expression expr can be a color specification such as RGBColor[…] or Red, an Image or Image3D object, or an explicit list of color channel values. When converting to or from "Grayscale", "RGB", "CMYK", and "HSB", channel values are clipped to be between 0 and 1. 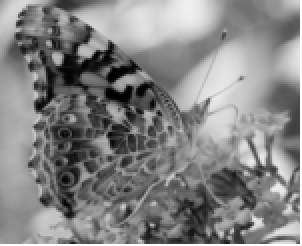 When converting to and from "XYZ", "LAB", "LUV", and "LCH", channel values are not clipped and when applied to images will result in an image of a real type. ColorConvert automatically performs chromatic (white point) adaptation. D50 white point is assumed for "XYZ", "LAB", "LUV", and "LCH" and D65 for "RGB", "CMYK", "HSB", and "Grayscale". When converting to and from "RGB", the channel values are assumed to be in the sRGB color space. ColorConvert[input,src->dst] can be used to convert to the color space specified by dst, while interpreting channel values in input according to the color space src. Both src and dst can be either a known color space or a color profile. ColorConvert[image,colspace] is equivalent to ColorConvert[image,ImageColorSpace[image]->colspace]. Color space specified by src should be compatible with the number of channels in image. If dst is a color profile, one of the device or connection spaces should match the color space of the input or a specified source color space src.